Here they are, my new binoculars! From now on, I’ll be focusing on variable star observing with binoculars! 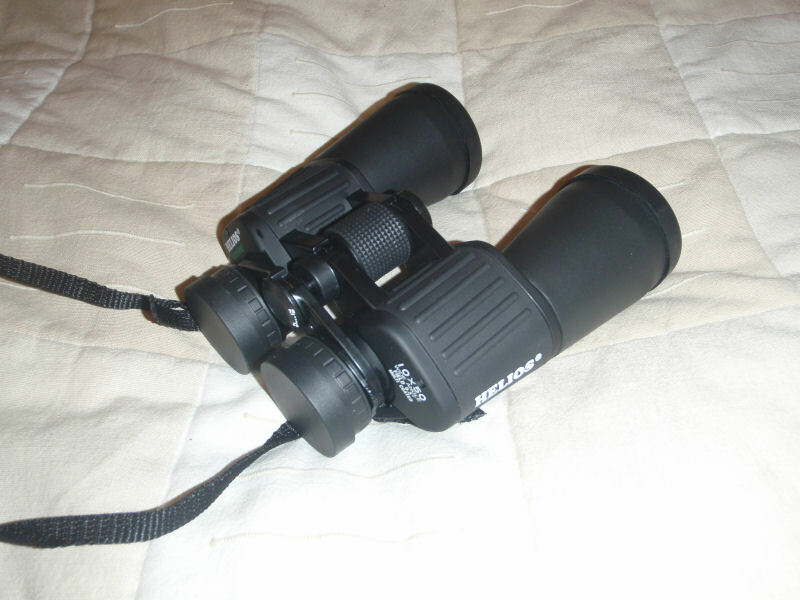 The pair of binoculars that I bought are Helios 10×50 and the field of view of the binos is 6,5°. The binos are quite light, and observing with them is pleasent. I still have to make a real test under dark sky to get conclusive results. The stars that I’ll be monitoring from now on are: rho Cas, Mu Cep, W Cyg, TV Psc, Y CVn, g Her, Psi 1 Aur and UU Aur. All of these stars are somekind of semiregular variables, and they all have quite small amplitude, and it’s possible for me to observe these stars throughout the entire cycle of light variations! All of these stars are included in the binocular program of AAVSO, and most of them are included in LPV Legacy- and LPV -programs as well. My new Helios 10×50 binos. Finnish atmospheric optics -enhusiasts gathered to Tähtikallio observatory center in Artjärvi, Southern Finland between 6th and 8th of June. The numer of participants was 19, which is 4 more than last year and 6 more than two years ago! Some of the participants came from as far as Oulu, which is a city 500 km away from the Tähtikallio observatory center! Also surprisingly many new participants had arrived to the event, which is a fact I’m very delighted to state! The programme of the meeting was very flexible. We started when all the participants had arrived to the site in saturday afternoon. The meeting started with my review of the Halo April 2014 -observing campaign. After that, Marko Mikkilä from Nivala talked about his recent halo discovery, 32° arc. Besides this, he also showed his amazing pictures of the mega-scale halo display of 14th of May 2014. After the presentations given by Marko Mikkilä, another Marko, Marko Pekkola talked about current issues of the Taivaanvahti -observation database of Ursa astronomical association. 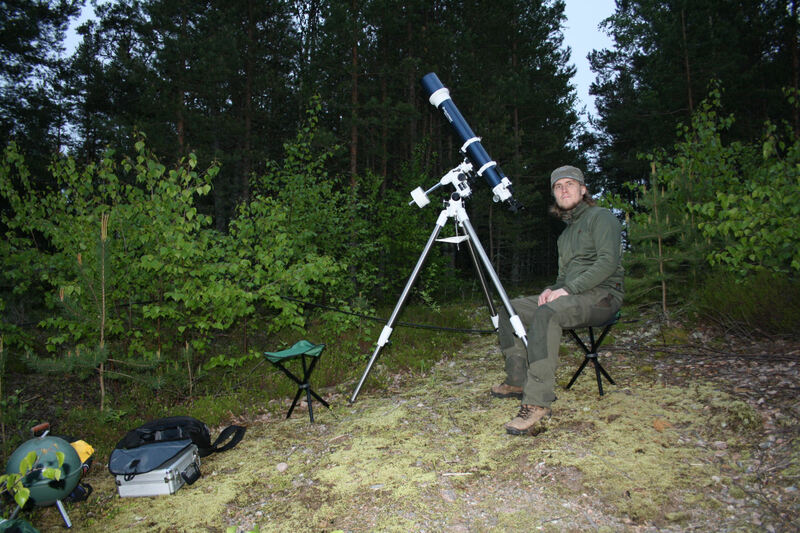 After this short session, Veikko Mäkelä held a workshop -like session about observing noctilucent clouds. The grand finale of the meeting was again the great photo show, where participants could show their best photos of atmospherical phenomena from recent year. 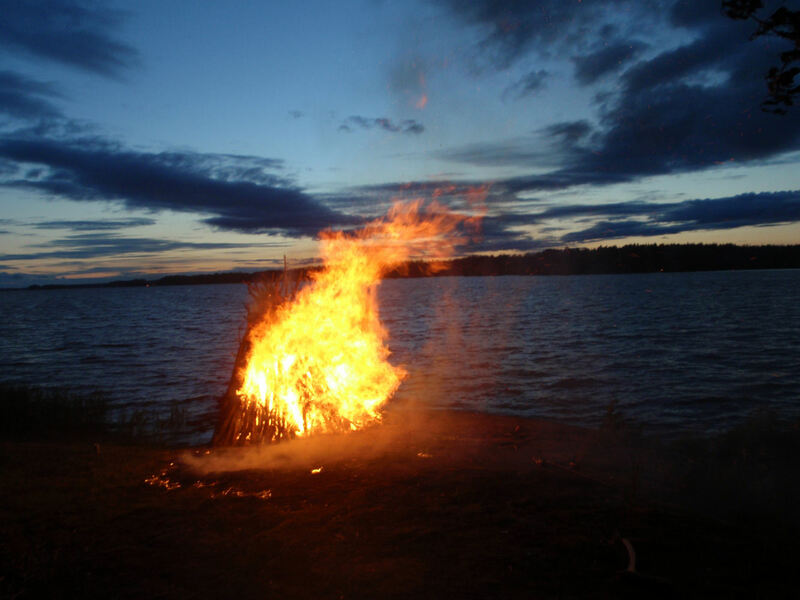 Besides the formal programme, we also had sauna and barbequed some sausages at the campfire in the evening. We also tried to observe noctilucent clouds, but we didn’t see any. Weather was fine during the event, there were though some random showers and we heard thunder rumbling once. Group photo of the participants of the event. All participants are in this photo! All photos © Juha Ojanperä.